A major U.S. chemical company was experiencing difficulties in meeting its targeted production quota because of leaking distributor tray seals inside a chemical processing column at one of its manufacturing plants. The leakage was confined to one of several processing columns and affected only one of 24 industrial chemicals manufactured at the plant. It was frustrating and, worse yet, said a plant representative, "it meant that we couldn't achieve our planned production rates at the plant." The column contained 18 horizontal trays, positioned every two feet of the column's height. Acid spilled downward from the top of the column, built up on the tray below, spilled through special openings in each tray and fell to the next level, where the process was repeated until the chemical made its way through all 18 trays and finally arrived at the bottom of the column. The final product is used in-house or sold to other manufacturers. During this process, the temperature inside the column was kept at -20° F and below as gas vapor was forced upward through the falling liquid, which absorbed the gas. The multiple trays and the mini-"waterfalls" between trays provided maximum surface area for the liquid to be in contact with the gas vapor. To achieve this, however, the liquid must be uniformly distributed by the trays, the plant rep pointed out. "You want the liquid to run across the tray and flow down through the holes so that it is evenly distributed across the column," he explained. "The problem we had was that some liquid was running down the wall, traveling underneath each tray and then dropping. For the trays to work to our standards of efficiency, they needed to be tightly sealed against the wall so they wouldn't allow this seepage." Each tray was seated on a ring that runs around the circumference of the column's interior wall - a distance of 10 1⁄2 linear feet. "Five of the column's 18 trays had critical seals to maintain. We had to seal joints (between the ring and the wall) all the way around those five in addition to several joints making up each tray" - a total of 83 linear feet for the five trays. But that was only a part of the sealing problem. "Each tray was fitted with a about two dozen cylindrical 'bubble caps,' which fit into holes in the tray." The caps were necessary, he explained, so that the liquid level on the tray rose to a specific depth before overflowing into the holes. Once again, the objective was uniform distribution and improved processing efficiency. "If the bubble caps leak," said the rep, "you can't maintain the right liquid level." Therefore, the joint between the bubble cap and the hole that it fit into also had to be sealed. Still another area of potential leakage were the "manway" covers. In order to access the trays for maintenance, an opening large enough for a worker to fit through was cut out of each tray. When the processing line was in operation, a cover fit over the opening. "Besides sealing the joints (where the trays meet the interior column wall) and the bubble caps, we also needed to seal the edge of the manway covers so they couldn't leak," said the rep. Facing such a formidable sealing challenge, the plant tried sealing the tray edges, bubble caps and manways with traditional gasket materials. But, maintenance workers discovered, these gaskets wouldn't conform well enough to the surface for a tight seal, and further attempts to "squeeze" the gaskets into tight seals failed because not enough force could be exerted using the tray bolts. It was about this time that the plant representative had occasion to visit the National Association of Corrosion Engineers annual expo in Houston. While wandering the floor of the exhibit hall, the engineer spotted the Pelseal® Technologies booth. Pelseal, headquartered in Newtown, PA, specializes in developing, manufacturing and marketing fluoroelastomer-based adhesives, coatings, sealants and caulks. Best known under such trade names as Viton™ (DuPont Dow Elastomer, LLC) and Fluorel® (Dyneon), fluoroelastomers are fluorine-containing hydrocarbon polymers that maintain their performance characteristics even under harsh service conditions. Because of the inclusion of fluorine in the polymer backbone, fluoroelastomers are able to maintain their performance characteristics even when subjected to attack by the most aggressive chemicals and corrosive liquids, including concentrated sulfuric, hydrochloric and nitric acids, and hydrocarbons. They are also capable of withstanding temperatures across a broad temperature range (-40° to +400° F). "I had known about Pelseal sealants for about 10 years," recalled the engineer. "We had previously used their Pelseal 2077 (a viscous, but self-leveling one-part product) in one of our plants to seal manway covers and trays. At that time, we had been using a Viton gasket as the material of choice. We didn't have enough bolting to pinch down a preformed gasket, and had to find a sealant in liquid form. Looking through a list of suppliers, we discovered that Pelseal made a liquid Viton. We tried it and it worked. We subsequently also used it in several plants at our site where we didn't have enough bolting to really seal off conventional gasketing." 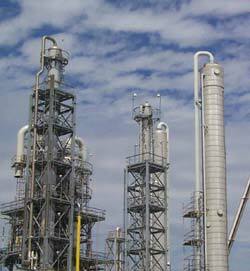 This prior application was generally similar to the current one involving the chemical processing column. Service conditions with the new situation were another story, however, because this chemical processing operation took place at cryogenic temperatures, where flexible materials have a tendency to become harder, inflexible and brittle. Would Pelseal, which was well known for its heat-resistant properties, also work well at a constant minus 20° Fahrenheit? After analyzing the engineer's predicament, Pelseal Technologies shipped a sample of Pelseal 2077 so that the plant's maintenance people could use the sealant ASAP. Upon arrival at the plant, field crews immediately began applying the sealant on the column's three problem areas. Around the trays, "we simply applied the sealant with a caulking gun - just put a bead of caulk on that tray rim, set it down, and it filled in all the voids," said the engineer. "Once it was set up, we put a little extra compression on the formed in-place gasket, using the perimeter tray bolts, to add extra sealing force." A similar procedure was applied to the bubble caps. "We put a little bead on the flanged lip on the bubble cap, which is only held by one bolt." We let Pelseal partially set up and then added a little compression by tightening the bolt." Sealing the manways, however, posed a different problem. Since they needed to be removed for maintenance, they couldn't be sealed permanently, yet had to remain leakproof. "On the manways, we used a Viton foam gasket and stuck it down to the tray with Pelseal so that it acted like a compressed-foam gasket," the engineer said. Soon after the sealant was applied in August 1999, the chemical processing line was activated - without incident and without further leakage. The column is finally able to operate at or above design efficiency," the engineer said. "That means we're not getting the leaks we had before. The system is working like it's supposed to. By eliminating leakage, we've improved efficiency and process time. In our business, if you improve efficiency, you're ahead. We now plan to use the sealant at other locations which have similar leaking problems and that are compatible with Viton."